Finding sustainable methods to control pest insects that affect crop yield is a pressing, worldwide concern for agriculture. In recent decades, there has been interest in developing less toxic chemical pesticides, and more sparse regimens for application of these pesticides to avoid also killing beneficial insects during pesticide applications. For this study, insects were collected from four farms in Central Massachusetts (Middlesex and Worcester Counties) to compare the population levels of beneficial and harmful insects at commercial farms using organic vs. chemical pest control methods. Three of the farms used organic insect controls and one of the farms used non – organic chemical insect controls. It was predicted that farms using only chemical pesticides would have lower numbers of both beneficial and harmful insects compared to farms that use organic pesticides. The total number of insects trapped at the four different farms employing different insect control strategies (non – organic chemicals vs. organic) did not have a statistically significant difference. However, there were fewer beneficial predatory beetles (Carabidae: Coleoptera) found at a farm (site the farm with fewer beetles) using non - organic chemical pest controls (Chlorantraniliprole, Lambda-cyhalothrin, and Imidacloprid) compared to another farm using only one biopesticide, (Spinosad). Our results suggest chemical insect controls have unintended consequences on agroecosystems and merit further study. Crop losses due to insect pest pressures have been a major problem for global food security. In both developed countries dependent on industrial agriculture and developing countries dependent on small family farms, food shortages due to crop destruction by insects can be devastating at local or national scales. In the United States, the corn rootworm Diabrotica virgifera virgifera causes more than a billion dollars in crop losses (to corn and soybean) and pest control costs annually ((Gray ME. Adaptation and invasiveness of western corn rootworm: intensifying research on a worsening pest*. Annu Rev Entomol. 2009;54:303-321.)). In parts of Africa sucking pod bugs have been shown to cause damage to upwards of 69% of total seeds on Cajanus cajan (pigeon pea), which is an important food grain in Africa, Southern Asia, and South America((Minja T, Shanower, Songa, Ongaro, Kawonga, Mivha. Studies Of Pigeonpea Insect Pests And Their Management In Kenya, Malawi, Tanzania And Uganda. Africa Crop Sci J. 1999;7(1):59-69.)). In India, insect pests damage 13 to 67% of the Solanum melongena (eggplant) crop ((Yadav SR, Kumawat KC. Assessment of crop losses due to insect pests of brinjal, Solanum melongena Linn. Insect Environ. 2013;19(1):16-18.)). In Brazil, crop losses by insects cause an annual loss of 25 million tons of food and biofuel ((Oliveira C, Auad A, Mendes S, Frizzas S. Crop losses and the economic impact of insect pests on Brazilian agriculture. Crop Prot. 2014;56(1):50-54. http://www.researchgate.net/publication/259122122_Crop_losses_and_the_economic_impact_of_insect_pests_on_Brazilian_agriculture.)). To combat these crop losses, synthetic chemical insecticides were introduced to commercial agriculture in the United States ~ 75 years ago ((Muir P. A History of Pesticide Use. Oregon State Univ. 2012. http://people.oregonstate.edu/~muirp/pesthist.htm.)). Since their first invention and implementation, nearly 900 different chemical compounds have been synthesized and used as pesticides against insects that damage human agriculture and affect public health. In the early years of pesticide research, dichlorodiphenyltrichloroethane (DDT) was believed to be low cost, safe and successful at controlling insect pests. In agricultural applications it increased crop yield in New York and Wisconsin from 56 to 68%. Used as “death control” in India, DDT reduced the number of cases of malaria from 100 million annually in 1933 to 150,000 annually in 1966, by killing mosquito disease vectors that transmit malaria ((Metcalf RL. A Century of DDT. J Agric Food Chem. 1973;21(4):511-519.)). Applications of DDT and other related chemical insecticides were thought to be simple, harmless solutions to increasing food security and controlling human infectious diseases transmitted by insects. However, it was later discovered that these insecticides had unintended effects on agro-ecosystems and the environment. Rachel Carson’s book Silent Spring was the first to explain unintended consequences of pesticide use, and to explain the connection between non - target bird exposure and deaths (especially bald eagles) to DDT to the general public, spawning the modern environmental movement. In 1973 the average US inhabitant had 2.3 to 4 ppm of DDT in their body fat. Countries with higher usage of DDT like India, had 16ppm of DDT in the body fat of humans ((Metcalf RL. A Century of DDT. J Agric Food Chem. 1973;21(4):511-519.)). Studies done in the 1990s showed a possible link between DDT uptake and increased levels of pancreatic, liver, breast and lung cancers, diabetes, fetal loss, as well as possible negative neurodevelopmental effects ((Eskenazi B, Chevrier J, Rosas LG, et al. The Pine River statement: human health consequences of DDT use. Environ Health Perspect. 2009;117(9):1359-1367. doi:10.1289/ehp.11748.)). Insecticide exposure also promotes evolution of resistance, requiring more compound to be applied for the same toxilogical effects. Insecticide resistance was first documented in 1914 among San Jose scale insects (Quadraspidiotus perniciosus ) at agricultural orchard sites in Washington ((Melander A. Can Insects become resistant to sprays? J Econ Entomol. 1914;7:167-173.)). Since then, numerous cases of insecticide resistance have been recorded. In a 2010, study about one third of a pooled population of sampled insects were found to have developed a 1-6% resistance to Bacillus thuringiensis ((Tabashnik B, Brevault T, Carriere Y. Insect Resistance to Bt Crops: Lessons from the First Billion Acres. Nat Biotechnol. 2013:510-521. doi:1038/nbt.2597. )), and Drosophila melanogaster (fruit flies) were found to develop resistance to DDT ((Harrop TWR, Sztal T, Lumb C, et al. Evolutionary changes in gene expression, coding sequence and copy-number at the Cyp6g1 locus contribute to resistance to multiple insecticides in Drosophila. PLoS One. 2014;9(1):e84879. doi:10.1371/journal.pone.0084879.)). Broad spectrum insecticide use has been shown to have adverse effects on non-target species including beneficial insects. For example, the newer generation of pyrethroids and organophosphates were thought to break down faster and be less harmful to organisms compared to DDT, but scientists are now implicating these compounds to be part of a group of stressors that are cardiotoxic, and neurotoxic to honeybees (Apis mellifera) ((Desneux N, Decourtye A, Delpuech J-M. The sublethal effects of pesticides on beneficial arthropods. Annu Rev Entomol. 2007;52:81-106. doi:10.1146/annurev.ento.52.110405.091440.)). A recent study has shown that pesticide use can increase the susceptibility of honeybees to infection by Nosema ceranae, a pathogen that has been shown to reduce the life span of honeybees and increase their mortality in winter ((Pettis JS, Vanengelsdorp D, Johnson J, Dively G. Pesticide Exposure in Honey Bees Results in Increased Levels of the Gut Pathogen Nosema. NCBI. 2013:153-158. http://www.ncbi.nlm.nih.gov/pmc/articles/PMC3264871.)). The decrease of populations of essential beneficial insects like honeybees, which may be being exacerbated by indiscriminate pesticide usage, could be debilitating to regional or even national food production. The recognition of the unintended effects of insecticides such as insecticide resistance, target pest outbreaks, and environmental contamination prompted new techniques of insect control to be developed. In the 1970s Integrated Pest Management (IPM) emerged as a technique that utilized biological and chemical controls to maintain optimum agricultural yield while reducing negative environmental and human health effects. Because IPM can often be time consuming and complicated, implementation of IPM is not universally implemented, and farmer outreach teaching how to implement IPM programs are not available to all farmers internationally ((Ehler LE. Integrated pest management ( IPM ): definition , historical development and implementation , and the other IPM. Pest Manag Sci. 2006;789(june):787-789. doi:10.1002/ps.)). However, new techniques related to IPM have been emerging in order to control insect pests. Biopesticides, mass produced agents extracted from living organisms, have received increased attention because they have a range of attractive properties and produce less toxic residue compared to chemical pesticides. However, it is often hard for farmers to switch from using chemical pesticides to biochemical pesticides because in many cases a multitude of biopesticide agents are needed in order to have the same controlling affect as synthetic organic compounds ((Chandler D, Bailey AS, Tatchell GM, Davidson G, Greaves J, Grant WP. The development, regulation and use of biopesticides for integrated pest management. Philos Trans R Soc Lond B Biol Sci. 2011;366(1573):1987-1998. doi:10.1098/rstb.2010.0390.)). Because the unintended effects of broad spectrum insecticides on beneficial insect communities are not yet fully known, further research must be done on this topic. Neither chemical nor organic insecticides have been shown to completely control insect pests without having unintended effects on agro-ecosystems. Here, the effects of different insect control mechanisms in local Massachusetts farms were investigated to determine whether pesticide program affected harmful and beneficial insect populations on small farm settings. Arthropods and nematodes were sampled weekly from four farms in central Massachusetts (Worcester and Middlesex County). The resulting data were analyzed to determine the effects of different pesticide application protocols on local, farm - level insect populations. The results of our study give insight into how different control regimens affect relative numbers of harmful and beneficial insects on small – scale, diverse local agro-ecosystems. Farm number one (F1), located in Leominster, Massachusetts primarily uses three types of pesticides. F1 uses Chlorantraniliprole (DuPont Coragen Rynazpyr), Lambda-cyhalothrin (Warrior with Zeon Technology Syngenta ((Lambda-cyhalothrin. Natl Pestic Inf Cent. 2001. www.npic.orst.edu/factsheets/l_cyhalogen.pdf. )), and Imidacloprid (Provado1.6 Bayer) ((IMIDACLOPRID. ; 2010. npic.orst.edu/factsheets/imidagen.pdf.)). F1 grows kale, cabbage, collard greens, watermelon, lettuce, apples, peaches tomatoes, eggplant, and corn. Traps were set near kale, cabbage, collard greens and tomatoes). Farm number four (F4), located in Lincoln Massachusetts uses Bacillus thuringiensis (Dipel DF Dry Flowable), Copper Ammonium Complex (Liqui-Cop Copper Fungicidal Spray) ((Liqui-Cop Copper Fungicida. Spray. ; 2002. http://www.montereylawngarden.com/documents/public/products/Liqui-Cop-2-column-(05).pdf. )), and Spinosad (Naturalyte Insect Control, Enrust) to control pests. F4 grows asparagus, kale, cabbage, collard greens, strawberries, lettuce, tomatoes, and eggplant. Traps were set near kale, cabbage, collard greens, and tomatoes. All farms primarily targeted Aphididae, and Pieridae. At each farm four different trapping methods to collect insects were utilized to assess the community of insects at each location, and insect collections were repeated on 3-4 dates at each location (Table 1). Table 1: Location and Information about Data Collection Techniques during the experiment. The first trapping technique was a soil trap baited with yeast to capture soil dwelling insects ((Cranshaw W. Attractiveness of Beer and Fermentation Products to the Gray Garden Slug, Agriolimax reticulatum (Muller) (Mollusca: Limacidae). Bioagricultural Siences Pest Manag. 1997;97(1).)) (Figure 1a). The second trapping technique (Figure 1b) was a soil trap made of a black thirty gallon garbage bag, baited with cabbage and grape juice. The third collection method (Figure 1c) was a soil trap baited with molasses, vegetable shortening, and yeast. The fourth trap (Figure 1d) was an air trap that was designed to catch flying insects that would stick to the vegetable shortening coated yellow tray. On each farm traps were set up in three different locations (Table 5). On F1and F2 samples were taken for four weeks. On F3 and F4 samples were taken for three weeks. These trial numbers varied due to the onset of winter. Samples were only collected using these standardized traps and all insect specimens found on the traps were placed in individual clear containers filled with rubbing alcohol for preservation. Specimens were identified to their family, and the total number of insects per family per trap were recorded. While collecting insects from Trap D, some traps were lost and found after 2-3 weeks. Because those traps contained specimen from a span longer than one week, data from all Trap D’s was not included in the analysis. To assess how different insect control regimens might affect taxonomic diversity of beneficial and harmful insects, insects were collected from four farms with varying pesticide application protocols. Two tailed t-tests were performed comparing the total quantity of insects caught with all trapping methods between each farm, and comparing the number of insects in specific harmful or beneficial taxonomic categories. Two tailed t-tests were performed to compare each farm (F1 to F2; F1 to F3; F1 to F4, F2 to F3; F2 to F4; F3 to F4). All t-tests were two sided and 95% confidence interval was assumed making the Tcritical value = 4.30 for all t-tests. At each sampling date, all insects from all traps were collected. The total numbers of insects collected at each farm were compared with a t-test and were significantly different between F2 and F4 in trap B (P = 0.0397) (Figure 2). Figure 2: Average number of insects collected in the three trap types. Comparison by two tailed t-test showed only insects collected in Trap B at F2 and F4 to be significantly differing from one another. Error bars show standard deviation. 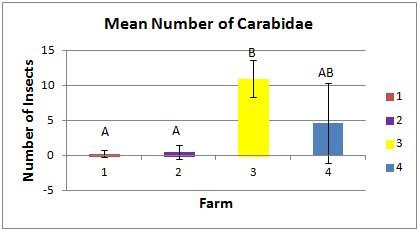 In statistical comparisons of insects in each family it was found that only the Carabidae population was significantly different among the four farms (Figure 3). F3 had significantly higher numbers of Carabidae beetles compared to F1 with (P=0.0208). F3 also had significantly higher numbers of Carabidae beetles compared to F2 with(P=0.0250). Figure 3: Average number of Carabidae ground beetles per farm. F3 was found to have a significantly higher number of Carabidae beetles compared to F1 and F2. Error bars show standard deviation. When statistically analyzing the numbers of beneficial insects, the following orders of arthropods were grouped as ‘beneficial or neutral’ for ecosystem integrity based on their diet: Araneae ( Lycosidae, Araneidae, Phalangidae, Oxyopidae, Encyrtidae), Coleoptera (Carabidae, Scarabidae, Staphylinidae, Anobiidae, Siliphidae,), Diptera ( Muscidae, Tachinidae, Bibionadae, Scathophagidae, Tabanidae, Culicidae, Chelonariidae, Calliphoridae), Hymenoptera (Formicidae, Ichneumonidae, Braconidae, Vespidae), Lepidoptera (Pieridae), Nemobinae, Orthoptera (Acrididae, Gryllidae). Since the diets of these arthropods consisted of other insects or animals they were considered beneficial by eating potential crop harming insects. Arthropods that may not feed exclusively on crop harming insects they are also grouped with the beneficial insects and are considered neutral. Orthopterans (grasshoppers and katydids) are herbivores but do not feed on the agricultural crops grown at the farms used in this study, so they are included in the beneficial or neutral category. F1 had significantly greater numbers of beneficial insects compared to F2 with P=0.0122 (Figure 4). Coleptera (Monotomidae),Diptera (Ceratopogonidae, Drosophilidae, Heleomyzidae, Tephritadae), Haplotaxida (Acanthodrilidae), and Hemiptera (Aphididae). Non-insect potential herbivores collected are Nematoda (Rhabditidae, Nematode), and Spirobolida (Julidae). Spirobolida (commonly known as millipedes) are arthropods, whereas Nematoda (commonly known as slugs) are not arthropods. These arthropods and nematodes feed on plants so they were categorized as harmful. There was no statistical difference in the number of harmful insects collected at each farm (Figure 4). The Simpson index is a measure of species diversity in ecosystems, and takes into account species richness (how many species are present) and species evenness (if one or few species dominate the community). It is measured with the D statistic ranges from 0 to 1 with D value of 0 representing infinite diversity and D values closer to 1 representing low diversity. Based on the taxonomic diversity (using the Simpson Index D) of different insects present, F3 had the most taxonomic diversity (D = 0.1557) while F1 has the least taxonomic diversity (D =0.342) (Figure 5). D values of zero indicate infinite diversity and D values of one represent only one species. Figure 5: Taxonomic Diversity of Insects collected at each Farm. F3 had the most taxonomic diversity, while F1 had the least taxonomic diversity. Ever since the dawn of the modern environmental movement, farmers have struggled with how to control harmful pest insects while not affecting the community of neutral or beneficial insects on their farms. While it is often much faster and easier to apply broad – spectrum insecticides, crops grown in a sustainable or organic manner often command a premium market price, so there is significant demand for developing effective organic or low – input methods of agricultural pest control. Industrial modern agriculture, which often depends on homogeneous, fragmented landscapes and the application of broad spectrum insecticides kills beneficial as well as harmful insects can significantly decrease the population levels of insects that provide beneficial ecosystem services ((Tscharntke T, Klein AM, Kruess A, Steffan-Dewenter I, Thies C. Landscape perspectives on agricultural intensification and biodiversity – ecosystem service management. Agroecology. 2005;8:857-874. doi:10.1111/j.1461-0248.2005.00782.x.)). Cranberry production IPM programs in Massachusetts, which started in 1983, were shown to be used by 80% of Massachusetts growers in 2008 and of those growers more than 50% reported with the effectiveness and low price of IPM tactics which included sweep nets, pheromone traps, visual inspection and select use of reduced risk compounds ((Thrupp LA. Linking Agricultural Biodiversity and Food Security: the Valuable Role of Agrobiodiversity for Sustainable Agriculture. Int Aff. 2000;76(2):283-297. doi:10.1111/1468-2346.00133. )),((Sandler HA. CHALLENGES IN INTEGRATED PEST MANAGEMENT FOR MASSACHUSETTS CRANBERRY PRODUCTION? : A HISTORICAL PERSPECTIVE TO INFORM THE FUTURE. (Burton EN, Williams P V., eds.). Nova Scotia Publishers; 2008.)). Some insects provide irreplaceable agro - ecosystem services by pollinating crops and acting as natural enemies of pest insects and plant disease vectors ((Aizen MA, Gemmill-herren B, Lebuhn G, Packer L. Pollination and other ecosystem services produced by mobile organisms? : a conceptual framework for the effects of land-use change. Ecol Lett. 2007;10:299-314. doi:10.1111/j.1461-0248.2007.01018.x.)). The four farms in this study are typical of the small, diverse farms found in the Central Massachussetts area. All farms in this study grew kale/cabbage/broccoli (Brassica oleracea), lettuce (Lactuca sativa), and tomato (Solanum lycopersicum) but other species of crops grown varied. For example eggplant (Solanum melongena) was grown at three farms (F1, F3, and F4) and apples (Malus domestica) was only grown at F1 and F2. Insect sampling was done using ten traps of four types at each farm set up near the same types of crops (primarily B. oleracea, and S. lycopersicum). A difference in the number of beneficial insects collected at F1 and F2 was found, with F1 having significantly higher numbers of beneficial insects compared to F2. Because of the trap type used certain species of insects might have been under represented. For example, only trap B used cabbage as bait, so insect pests which eat vegetables like lettuce or asparagus might be not have been drawn to the traps. Also, since most traps used molasses and yeast bates insects that dwell on fruits of crops like tomatoes and apples might be over represented. Taking into account these factors, no significant difference in the number of harmful insects at each farm was found (Figure 4). So, all four types of insect control methods were equally effective in controlling the numbers of harmful insects. This finding is especially interesting because it supports the premise that using different combinations of organic pesticides may be as effective as using other non-organic pesticides. The majority of Carabidae species found in North America are predators and are largely beneficial because they prey on other insects, including many agricultural pests ((Reardon R. Biological Control of The Gypsy Moth: AN OVERVIEW. For Heal Technol Enterp Team. 2012. http://www.main.nc.us/SERAMBO/BControl/gypsy.html.)). F1 had the least number of Carabidae, and F3 had the most Carabidae (Figure 5). This indicates that the chemical pesticides used at F1 and the organic pesticides used at F2 may be adversely affecting the population of Carabidae beetles. The EPA and National Pesticide Information Center showed that doses of Chlorantraniliprole can affect the mortality of Cocinnella septempunctata, beneficial beetles that have similar eating habits as Carabidae, and Imidacloprid uses the same mode of action (Table 1) on Carabidae ((IMIDACLOPRID. ; 2010. npic.orst.edu/factsheets/imidagen.pdf.)),((EPA. Chlorantraniliprole Fact Sheet. ; 2008.)). Studies done on populations of Carabidae beetles found that various chemical pesticides may depress populations of non-target species by reducing food sources and habitat modification ((Toor RF VAN. THE EFFECTS OF PESTICIDES ON CARABIDAE (INSECTA: COLEOPTERA), PREDATORS OF SLUGS (MOLLUSCA: GASTROPODA): LITERATURE REVIEW. New Zeal Plant Prot. 2006;59:208-216.)). Direct toxic effects of pesticides on Carabidae may be reduced in agro-ecosystem settings due to the nocturnal nature of the insect, but even so there are specific direct effects of particular types of pesticides on specific species of Carabidae. ((Holland JM, Luff ML. The effects of agricultural practices on Carabidae in temperate agroecosystems. Integr Pest Manag Rev. 2000;5:109-129.)). For example direct dosages of 0.336kg/ha of Imidaclopid to Carabidae made over seventy-five percent incapacitated for one day after exposure. Imidaclopid affected Carabidae were also found to be much more susceptible to attack by ants compared to non-intoxicated Carabidae ((Kunkel BA, Held DW, Potter DA. Lethal and Sublethal Effects of Bendiocarb , Halofenozide , and Imidacloprid on Harpalus pennsylvanicus ( Coleoptera? : Carabidae ) Following Different Modes of Exposure in Turfgrass Lethal and Sublethal Effects of Bendiocarb , Halofenozide , and Imidaclop. BioOne. 2001;94(1):60-67.)). This indicates that F1 may have had the lower numbers of Carabidae because the insect prey of Carabidae are not available in the agro-ecosystem or because of sublethal effects of the pesticides used at F1. Farm one was devoid of Aphididae and Collembola, both of which are prey of Carabidae. This is most likely due to its use of Lambda-cyhalothrin, and Imidacloprid. Both of these pesticides are designed to target aphids, among many other pests (Table 1). F2 had a significantly lower number of Carabidae beetles compared to F3. One possible explanation is that F1 and F2 are in closer proximity of one another and though they are in the same region with the other farms, their insect populations may not be that similar. A more likely explanation is that because samples from F1 and F2 were collected approximately three weeks later than samples from F3 and F4, the Carabidae beetle may have already begun to be inactive for the winter ((Jasku?a R, Soszy?ska-Maj A. What do we know about winter active ground beetles (Coleoptera, Carabidae) in Central and Northern Europe? Zookeys. 2011;100(6):517-532. http://www.ncbi.nlm.nih.gov/pubmed/3131035. Accessed November 19, 2014.)). Further research must be done to draw a more concrete conclusion. In this study the farm using only one type of microbial pesticide (Bascillus thurangenesis) was found to have significantly higher numbers of Carabidae beetles compared to the farm using three chemical pesticides and the farm using three organic pesticides. This suggests that there may be a relationship between higher chemical pesticide use and lower numbers of beneficial insects ((Aizen MA, Gemmill-herren B, Lebuhn G, Packer L. Pollination and other ecosystem services produced by mobile organisms? : a conceptual framework for the effects of land-use change. Ecol Lett. 2007;10:299-314. doi:10.1111/j.1461-0248.2007.01018.x. )), ((Kunkel BA, Held DW, Potter DA. Lethal and Sublethal Effects of Bendiocarb , Halofenozide , and Imidacloprid on Harpalus pennsylvanicus ( Coleoptera? : Carabidae ) Following Different Modes of Exposure in Turfgrass Lethal and Sublethal Effects of Bendiocarb , Halofenozide , and Imidaclop. BioOne. 2001;94(1):60-67.)). F3 was found to have the highest taxonomic diversity while F1 was found to have the least taxonomic diversity (Figure 5). This suggests that the chemical pesticides Chlorantraniliprole, Lambda-cyhalothrin, and Imidacloprid may have an adverse effect on taxonomic diversity. Studies have shown that biological control of insect pests is most effective when diversity of among entomophagous organisms is higher ((Cardinale BJ, Harvey CT, Gross K, Ives AR. Biodiversity and biocontrol: emergent impacts of a multi-enemy assemblage on pest suppression and crop yield in an agroecosystem. Ecol Lett. 2003;6(9):857-865. doi:10.1046/j.1461-0248.2003.00508.x.)). Natural diversity of plants in agricultural settings is important for insects that provide biological control of pests and pollination of crops ((Egan JF, Bohnenblust E, Goslee S, Mortensen D, Tooker J. Herbicide drift can affect plant and arthropod communities. Agric Ecosyst Environ. 2014;185:77-87. doi:10.1016/j.agee.2013.12.017.)). But, taxonomic diversity of arthropods and plants can be negatively impacted by disturbances from humans such as herbicide and insecticide applications, and from other insect species with short life spans ((Schellhorn N a, Bianchi FJJ a, Hsu CL. Movement of entomophagous arthropods in agricultural landscapes: links to pest suppression. Annu Rev Entomol. 2014;59:559-581. doi:10.1146/annurev-ento-011613-161952.)). The compounds used by the farms in this study are both organic and non – organic pesticides, and these compounds have economic positives and negatives. Products that include Bacillus thuringenesis can be appealing because the toxin produced is highly host specific and has no effects on non-target organisms ((Clark BW, Phillips TA, Coats JR. Environmental fate and effects of bacillus thuringiensis (Bt) proteins from transgenic crops: A review. J Agric Food Chem. 2005;53:4643-4653. doi:10.1021/jf040442k.)). However the organic insecticide has limitations due to the microbe’s susceptibility in sunlight, fluctuating temperatures and rain, and inability to affect pests feeding on internal tissues of crops ((Sanchis V. From microbial sprays to insect-resistant transgenic plants: history of the biospesticide Bacillus thuringiensis . A review. Agron Sustain Dev. 2010;31:217-231. doi:10.1051/agro/2010027.)). The non – organic chemical Chlorantraniliprole can be appealing because of its relative effectiveness against lepidopera as well as its minimal long term toxicity to mammals ((EPA. Chlorantraniliprole Fact Sheet. ; 2008.)). Some resistance found among certain Lepidoptera species makes it less appealing to farmers ((Guo L, Liang P, Zhou X, Gao X. Novel mutations and mutation combinations of ryanodine receptor in a chlorantraniliprole resistant population of Plutella xylostella (L.). PubMed. 2014;4(6924). )). Lambda-cyhalothrin was shown to most effectively control Trichoplusia ni (cabbage loopers), but mild to high toxicity was reported when the compound was inhaled and injested by model mammals ((Lambda-cyhalothrin. Natl Pestic Inf Cent. 2001. www.npic.orst.edu/factsheets/l_cyhalogen.pdf.)). Overall, this study supports the hypothesis that chemical pesticides and organic pesticides may have different effects on insect populations in agro-ecosystems. Our finding of more beneficial insects at the farm (F1) using chemical pesticides suggests this. The population dynamics of families of insects with substantial benefits to farmers, either through pollination or biocontrol potential of insect crop pests such as the Carabidae should be studied further, because significantly differing populations of beneficial insects may play important roles in crop protection and increasing yield in agro-ecosystems. Our study of insect populations at local farms showed that pesticide regimen can have complex effects on local faunal diversity, and that following a low – input regimen of pest control can have beneficial effects for local farm biodiversity and the potential for native insects to contribute to on – farm pest control instead of using chemical pesticides. We would like to acknowledge Dr. Lori Shapiro and Ms. Michelle Olivari for manuscript review and guidance throughout this project. We would also like to thank Dr. Naomi Pierce for permission to use facilities at the Harvard MCZ labs, and Mr. George Whittemore for assistance with statistical analysis techniques. We would also like to acknowledge Dr. Ryan Judkins for helping edit our paper. Further studies should be conducted to find a better solution to better protect the beneficial insects while keep the influence from bad insects. agrochemicals are supposed to improve the yeilding rate.